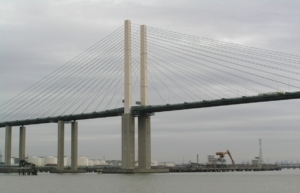 Delta Obstruction Lighting (DOL) was invited to tender by the QEII’s controlling authority in August 2008 and was awarded the contract in September 2008 to design, manufacture and install a system of six warning lights at each fixing point, that went above and beyond Civil Aviation requirements, and was compatible with the bridge’s remote-controlled SCADA (Supervisory Control and Data Acquisition) framework. DOL undertook the designing and manufacturing phases with sister company Delta International Steeplejacks (DSJ) commissioned for the installation. 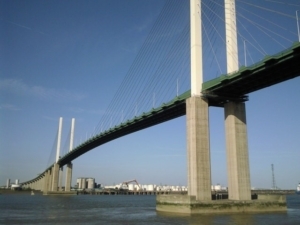 Far from being the highest structure Delta has worked on, the Queen Elizabeth II Bridge has certainly been one of its most challenging as it is surrounded by some of the busiest flight paths, roads and shipping lanes in Europe. Challenges were a plenty throughout this project. However, Delta has an unrivalled ability to adapt to a project’s changing needs. The original brief was to provide a single duty light at each fixing point but DOL’s design team’s proposal to incorporate both duty and standby at each fixing point was eagerly accepted by the bridge’s contractors. Their initial plan was to fix two LED lights side-by-side, but on viewing the fixing points they discovered one light would block out the glare from the other. To prevent a potential disaster, it was imperative that no glare could be seen by ships passing underneath the bridge as red lights carry major significance to shipping. At first we considered sitting the duty light on top of the standby light, but that would have taken 10 weeks to develop and contract conditions had determined that installation had to proceed within two. Our ingenious solution was to design a single light where both LED lights sat within one casing unit..
Once finalised, the design was submitted for production and thanks to the state of the art manufacturing facilities at Delta’s Wrigley street factory in Oldham – the Dual WL2500 (duty and standby) Medium Intensity Aviation Obstruction Light was born. With 180,000 cars passing over the bridge daily, access was a serious consideration. In order for our engineers to enter the tower safely, the inside lane of the A282 had to be closed for 10minutes each morning and in the evening, temporary speed limits were introduced, with a roadblock of 6 highway trucks ushering vehicles into the central lanes. Although this decision was not taken lightly by the bridge’s contractors, health and safety is always a top priority. Despite a powerful North Sea wind and the biting cold, the job progressed well and by the end of the five days, all lights were installed to an extremely high standard and the system had passed the IET (Institute of Engineering and Technology) BS 7671 17th edition – a British standard. The team have since been called back twice to overcome snags relating to interfacing with the previous system. The system has now passed a function test and testing to ensure that it has fully interfaced with the bridge’s control tower and has been signed off by the client. Since this project, the WL2500 Duty and Standby Aircraft Warning Light has been developed into the WL2502 ,which launched in 2012, showing Delta’s drive to design and manufacture more and more efficient Aircraft Warning Lights.